Welcome to the self help section of the web site. Troubleshooting your dog's behavior problems. Creating a sound leadership-based relationship. Teaching your dog to willingly obey you. The Foundation Dog Training System is designed to give dog owners a systematic way to find out what's causing behavior problems and then develop the best possible plan to solve even the most difficult ones. It is called Foundation Style Dog Training because it uses the model of an 11 layer pyramid, with each successive level providing a foundation for the next one. Completing the final level, eleven, represents all the goals we have for our dog. 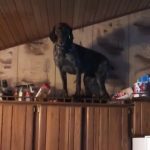 Achieving these goals depends on knowing what each successive layer means, how it depends on the preceding layer and feeds the following one, and how it applies to YOUR dog. Like a real pyramid, the top layer will be sturdy and long-lasting if and only if each one is solidly built and correctly positioned before going on to the next one. Health is a lower level because health issues can cause behavior problems. For instance, if a dog growls when we pet him, we need to find out if he has an ear infection or other ailment which is causing pain. If that's the only thing making him growl, there's no need to go to the higher levels of the pyramid. Similarly, if a dog suddenly starts urinating in the home, the first thing we should do is check for a urinary-tract infection. He may be peeing because he's unable to physically control himself, not some mysterious psychological reason. If your dog is slow to follow a "down" command, he may have sore joints. If your dog is constantly nagging you for petting and attention, you want to rule out the possibility that he may be seeking relief for dry and uncomfortable skin. Since behaviors like urinating or defecating in the home can have so many different causes, it is vital to start at the bottom and work your way up systematically, layer by layer. Is the problem caused by a health issue (layer 2)? Is it caused by an insecurity problem created by our own attitude and/or behavior (layer 3)? Are we using the most effective way to teach this particular dog (layer 4)? Is the urination or defecation due to a desire to mark the home (layer 5)? Is the dog having accidents because of an anxiety problem (layer 7)? Was the dog never properly housebroken and therefore just doesn't know any better (layer 8)? 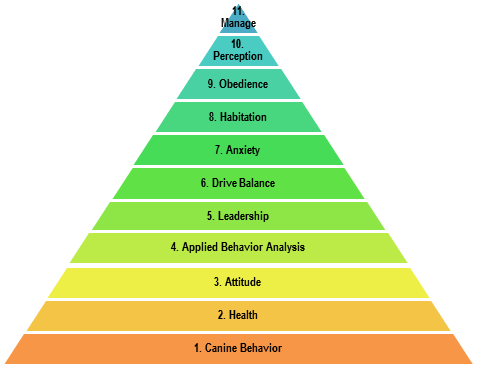 Every one of the 8 layers below "obedience" can prevent obedience training from succeeding. That's why every lower layer must be examined before working on a higher layer. 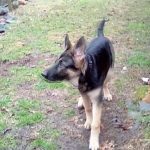 I have developed this system gradually, after many years of taking on the most serious behavior and obedience problems. Many of these dogs were already recommended to be euthanized by other professionals. I needed a system to help me quickly and systematically figure out what went wrong so that I could create the best possible plan to help both dogs and owners. The Foundation Dog Training System was designed with an open mind and will continue to evolve as I learn new and better ways to help every dog and owner, even if the dog has genetic and/or early developmental issues so severe that strong management techniques (layer 11) will always be needed in addition to obedience training (layer 9) and perception chsnges (layer 10). There is a forum on this site for members, where you can write about your dog's progress and communicate with like minded owners and trainers for extra support. To get started click on the first layer Canine Behavior. Good luck!